Not to be confused with Allen Trammel. Alan Stuart Trammell (born February 21, 1958) is an American former professional baseball shortstop, manager and coach. His entire 19-year playing career was with the Detroit Tigers. He currently serves as a special assistant to the General Manager of the Detroit Tigers. Trammell, nicknamed "Tram", played his entire career with the Tigers, highlighted by a World Series championship in 1984 over his hometown San Diego Padres and an American League East division championship in 1987. Although his arm was not overpowering, he had a quick release and made accurate throws, ultimately winning four Gold Glove awards. Trammell's defense perfectly complemented his double-play partner, Lou Whitaker. The two formed the longest continuous double-play combination in major league history, playing 19 seasons together. At the plate, Trammell was one of the best-hitting shortstops of his era and won three Silver Slugger awards. Trammell later served as Detroit's manager from 2003 through 2005. He also served as the interim manager for the Arizona Diamondbacks during the final three games of the 2014 season. While playing for the Tigers' farm team in Montgomery of the Southern League, Trammell played his first game with teammate Lou Whitaker before the two infielders were promoted, making their major league debut at Fenway Park together, during the second game of a double-header on September 9, 1977, the first of nineteen seasons together. Trammell batted .300 in 1980 as he made the All-Star team for the first time. In 1983 he batted .319 with 14 home runs, 66 runs batted in and 30 stolen bases. He won the MLB Comeback Player of the Year Award in the American League. Trammell and Whitaker also made a cameo appearance on the television show Magnum, P.I. starring Tom Selleck during the 1983 season. Selleck's character, Thomas Magnum (as well as Selleck himself), was a Tigers fan. Trammell, along with his Tiger teammates, enjoyed a championship-winning season in 1984, when they started the season 35–5 and won the World Series. Despite a season-long battle with tendinitis in his shoulder which caused him to miss 23 regular season games, he finished fifth in the AL batting race with .314 and ranked eighth in on-base percentage. In the 1984 American League Championship Series against the Kansas City Royals, Trammell hit .364 with one home run and three RBI. Finally, in the World Series, he was 9-for-20 against the San Diego Padres, including a pair of two-run home runs that accounted for all of the Tigers' runs in a Game 4 victory. Detroit won the series 4–1 and Trammell was named World Series MVP. In 1985, after two consecutive years of batting not lower than .314, Trammell was hampered by injuries and posted only a .258 batting average. He underwent postseason surgery on his left knee and right shoulder. The following season, playing without any injuries, Trammell became only the second player in Detroit history to hit 20 home runs and steal 20 bases (Kirk Gibson was the other and Curtis Granderson has since joined the club). Trammell also set a career-high with 75 RBI. In 1987, asked by manager Sparky Anderson to bat cleanup, Trammell responded with the best season of his career, hitting a career-high 28 home runs. In addition, Trammell appeared amongst the league leaders in most AL offensive categories: third in batting average (.343), tenth in RBI (105), third in hits (205), tied for fifth in runs (109), fourth in total bases (329), fifth in on-base percentage (.402), eighth in slugging average (.551), sixth in on-base plus slugging (.953), fifth in OPS+ (155), and tied for fifth in game-winning RBI (16). In September, he batted .416 with six homers and 17 RBI and put together an 18-game hitting streak in which he hit .457, helping his team to win the AL East division by two games on the last day of the season. He became the first Tiger to collect 200 hits and 100 RBI in the same season since Al Kaline did it in 1955. 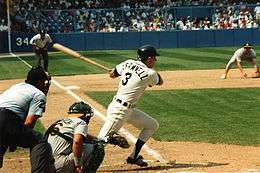 Despite his efforts, Trammell finished second to Toronto's George Bell in the MVP voting (332–311). After the season finale, Whitaker gave him second base, with the inscription: To Alan Trammell, 1987 AL MVP. From, Lou Whitaker. In the following years, Trammell suffered a long string of injuries that reduced his production. In 1991, knee and ankle injuries limited Trammell to 101 games. During the following season, he played in 29 games before breaking his right ankle and missing the remainder of the 1992 season. In his final five seasons, Trammell averaged 76 games played after averaging 140 games played the first thirteen seasons of his career. From 1993 to 1996, Trammell saw less time at shortstop in favor of Travis Fryman and eventually Chris Gomez and Andújar Cedeño. He instead saw playing time at multiple defensive positions, including shortstop, third base, second base, left field, center field, and designated hitter. 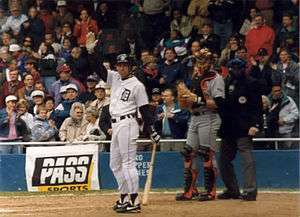 Trammell retired following the 1996 season. In his twenty-year career, Trammell batted over .300 seven times and ending with a career average of .285 and 185 home runs with 1,003 RBI, 1,231 runs, 2,365 hits, 412 doubles, 55 triples, and 236 stolen bases in 2,293 games. After his retirement, Trammell coached for Detroit (1999, hitting coach), the San Diego Padres (2000–2002, first base coach), and managed the Tigers (2003–2005). He served as the bench coach for the Arizona Diamondbacks under former teammate Kirk Gibson until returning to the Tigers in late 2014 as a special assistant to the general manager. In 2001, Trammell was rated as the ninth best shortstop of all time in "The New Bill James Historical Baseball Abstract", rating him higher than fourteen Hall of Fame shortstops. Furthermore, in recent years, Trammell's candidacy for the Hall of Fame has picked up increasing support from the sabermetric community. However, Trammell has not been enshrined into the Baseball Hall of Fame as of 2014. In his first twelve years of eligibility, he has received the following percentage of votes: 15.7% (2002), 14.1% (2003), 13.8% (2004), 16.9% (2005), 17.7% (2006), 13.4% (2007), 18.2% (2008), 17.4% (2009), 22.4% (2010), 24.3% (2011), 36.8% (2012), 33.6% (2013), and 20.8% (2014). His boost in recent years is likely due to voters being more receptive to advanced metrics, such as WAR (Wins above replacement). Trammell was on his 15th and final Baseball Writers' Association of America ballot in 2016, failing to earn enough for induction. Trammell was one of the last candidates to be allowed on the ballot for fifteen years after the BBWAA reduced eligibility to ten years, and can now be considered for the Veterans Committee Expansion starting from 2017. In 1998, Trammell was elected into the National Polish-American Sports Hall of Fame. Alan Trammell was named the manager of a struggling Tigers team on October 9, 2002. The team lost 119 games in his first season in 2003, an American League record, before posting a 72–90 record in 2004. In the 2005 season, however, the team's record regressed slightly, finishing 71–91. During Trammell's three years as manager, the Tigers compiled a record of 186–300. During the 2003 season, Detroit nearly matched the modern MLB record of 120 losses, set by the expansion New York Mets (40–120) in 1962. The Tigers won five of their last six games to avoid the distinction. On October 3, 2005, the Tigers released Trammell after three seasons in which the organization failed to post a winning record. Trammell was replaced by Jim Leyland on October 4, 2005. Leyland led Detroit to a 24-game improvement in the regular season, an AL pennant and a World Series appearance in 2006. While there was some media criticism regarding Trammell's managerial strategies and "nice" demeanor, others contend that he was a rookie manager put in charge of a team that was severely lacking in talent, and believe his managerial stint played an integral role in re-instilling professionalism and pride throughout the Detroit organization. Leyland himself attributed a degree of the success that the Tigers saw in the 2006 postseason to Trammell's efforts in the three years prior. In October 2006, Trammell returned to Comerica Park for the first time since his firing to participate, along with Sparky Anderson, in pregame festivities prior to Game 2 of the World Series. Trammell was showered with a lengthy standing ovation from Detroit baseball fans upon taking the field. After being replaced by Leyland, Trammell turned down an offer to stay with the Tigers as a special assistant, instead opting to sit out 2006. In October 2006, he agreed to join the Chicago Cubs as a bench coach for the 2007 season, a possible precursor to an eventual return to managing a major league club. During the four-game suspension of Lou Piniella in 2007, Trammell was acting manager of the Chicago Cubs. Trammell was passed over for the Cubs' managerial position when Lou Piniella retired midway through the 2010 season. Trammell was named bench coach of the Arizona Diamondbacks in October 2010 joining his former teammate Kirk Gibson who had earlier been named manager. Gibson had previously been Trammell's bench and hitting coach with the Tigers. He and Gibson were fired on September 26, 2014, though Trammell stayed on for the final three games of the season to serve as the interim manager. He had a record of one win and three losses in those three games. On November 3, 2014, it was announced that Trammell would return to Detroit as a special assistant to Tigers' general manager Dave Dombrowski. Had a 21-game hit streak during the 1987 season. Had a 20-game hit streak during the 1984 season. Along with teammate Lou Whitaker holds AL record playing together (1,918 games). They also set the major league record by turning more double plays than any other shortstop-second baseman combination in the long history of professional baseball. The Trammell–Whitaker duo twice won Gold Gloves together, joining a list of eight shortstop-second baseman duos have won the honor in the same season while playing together (1983, 1984). 1 2 "Alan Trammell". Baseball-Reference. Archived from the original on December 22, 2010. Retrieved January 13, 2011. ↑ "Selleck Strikes Out For Tigers". Chicago Tribune. April 4, 1991. ↑ "Bless You Boys: A Celebration of the '84 Tigers". Detroit Tigers. Retrieved January 13, 2011. ↑ Kappler, Brian (October 15, 1984). "Bad knee didn't halt Trammell". The Montreal Gazette. Retrieved January 13, 2011. ↑ Atkins, Harry (October 16, 1984). "Trammell picks up car". Gettysburg Times. Associated Press. Retrieved January 13, 2011. ↑ Donaghy, Jim (November 18, 1987). "Bell edges Trammell". The Hour. Associated Press. Retrieved January 13, 2011. 1 2 3 "Tigers fire Trammell after 71–91 season". ESPN. October 4, 2005. Retrieved January 13, 2011. 1 2 "Gibson reunites with Trammell in Arizona". USA Today. Associated Press. October 26, 2010. Retrieved January 13, 2011. 1 2 "Alan Trammell". polishsportshof.com. Retrieved January 4, 2015. ↑ Lage, Larry (October 9, 2002). "Trammell takes Tigers' managerial reins". USA Today. Associated Press. Retrieved January 13, 2011. 1 2 3 4 "Alan Trammell". Baseball Reference. Sports Reference LLC. Retrieved December 5, 2014. ↑ Crasnick, Jerry (October 20, 2006). "Trammell: 'I'll always be a Tiger'". ESPN. Retrieved January 13, 2011. ↑ "A Tiger Who Won, and Then Couldn't, Manages to Smile". The New York Times. Associated Press. October 22, 2006. Retrieved January 13, 2011. 1 2 Muskat, Carrie (October 24, 2006). "Trammell raring to go with Cubs". Major League Baseball. Retrieved January 13, 2011. ↑ "Mike Quade prepared for hot seat". ESPN. Associated Press. August 23, 2010. Retrieved January 13, 2011. ↑ "Diamondbacks fire Kirk Gibson". ESPN.com. September 27, 2014. Retrieved September 28, 2014. ↑ "Alan Trammell returning to Tigers as assistant to GM". The Detroit News. November 3, 2014. Retrieved November 3, 2014. ↑ "Trammell returns to Tigers as special assistant". Major League Baseball. November 3, 2014. Retrieved November 3, 2014. Wikimedia Commons has media related to Alan Trammell.